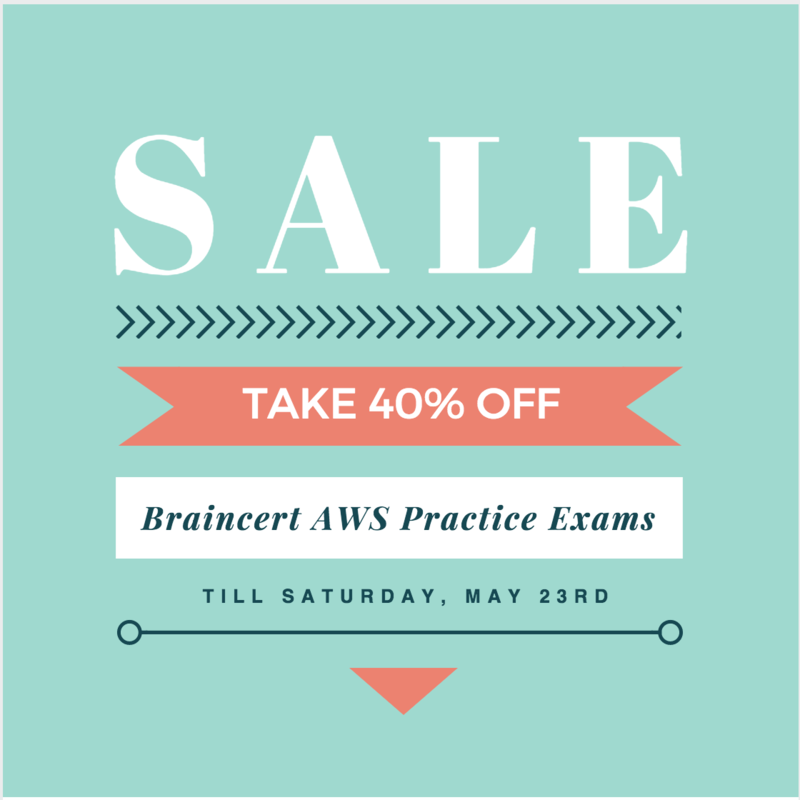 AWS Storage Options is one of the most important Whitepaper for AWS Solution Architect Professional Certification exam and covers a brief summary of each AWS storage options, their ideal usage patterns, anti-patterns, performance, durability and availability, scalability etc. You are developing a highly available web application using stateless web servers. Which services are suitable for storing session state data? Choose 3 answers. Use SQS for passing job messages, use Cloud Watch alarms to terminate EC2 worker instances when they become idle. Once data is processed, change the storage class of the S3 objects to Reduced Redundancy Storage. Setup Auto-Scaled workers triggered by queue depth that use spot instances to process messages in SQS. Once data is processed, change the storage class of the S3 objects to Reduced Redundancy Storage. Setup Auto-Scaled workers triggered by queue depth that use spot instances to process messages in SQS. Once data is processed, change the storage class of the S3 objects to Glacier. Use SNS to pass job messages use Cloud Watch alarms to terminate spot worker instances when they become idle. Once data is processed, change the storage class of the S3 object to Glacier. Setup an RDS MySQL instance with multiple read replicas in 2 availability zones to store the user preference data .The mobile application will query the user preferences from the read replicas. Leverage the MySQL user management and access privilege system to manage security and access credentials. Store the user preference data in S3 Setup a DynamoDB table with an item for each user and an item attribute pointing to the user’ S3 object. The mobile application will retrieve the S3 URL from DynamoDB and then access the S3 object directly utilize STS, Web identity Federation, and S3 ACLs to authenticate and authorize access. 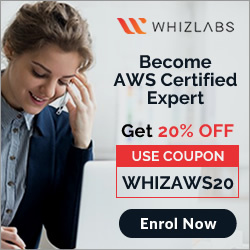 Use CloudFront and an Elastic Load balancer in front of an auto-scaled set of web servers, the web servers will first can the Login With Amazon service to authenticate the user then process the users vote and store the result into a multi-AZ Relational Database Service instance. Use CloudFront and an Elastic Load Balancer in front of an auto-scaled set of web servers, the web servers will first call the Login with Amazon service to authenticate the user, the web servers will process the users vote and store the result into a DynamoDB table using IAM Roles for EC2 instances to gain permissions to the DynamoDB table. Mobile application will send device location using AWS Mobile Push. EC2 instances will retrieve the relevant offers from DynamoDB. EC2 instances will communicate with mobile carriers/device providers to push alerts back to the mobile application. Lower the scale up trigger of your Auto Scaling group to 30% so it scales more aggressively. Set up a second installation in another region, and use the Amazon Route 53 latency-based routing feature to select the right region. Stateless instances for the web and application tier synchronized using ElastiCache Memcached in an autoscaling group monitored with CloudWatch. And RDS with read replicas. EBS with Provisioned IOPS (PIOPS) to store I/O files SOS to distribute elaboration commands to a group of hosts working in parallel Auto Scaling to dynamically size the group to hosts depending on the length of the SQS queue. Web servers store read-only data in S3, and copy from S3 to root volume at boot time. App servers share state using a combination of DynamoDB and IP unicast. Database use RDS with multi-AZ deployment and one or more Read Replicas. Backup web and app servers backed up weekly via AMIs, database backed up via DB snapshots. Setup RDS in multi-availability zone mode. Shard the database and distribute loads between shards. Use amazon CloudFront to cache database queries. Leverage CloudFront for the delivery of the articles. Leverage Elastic Cache for caching the most frequently used data. Elastic Transcoder to transcode original high-resolution MP4 videos to HLS EBS volumes to host videos and EBS snapshots to incrementally backup original rues after a few days. CloudFront to serve HLS transcoded videos from EC2. First, compress and then concatenate all files for a completed drug trial test into a single Amazon Glacier archive. Store the associated byte ranges for the compressed files along with other search metadata in an Amazon RDS database with regular snapshotting. When restoring data, query the database for files that match the search criteria, and create restored files from the retrieved byte ranges. The company should utilize an amazon simple work flow service activity worker that updates the users data counter in amazon dynamo DB. The activity worker will use simple email service to send an email if the counter increases above the appropriate thresholds. 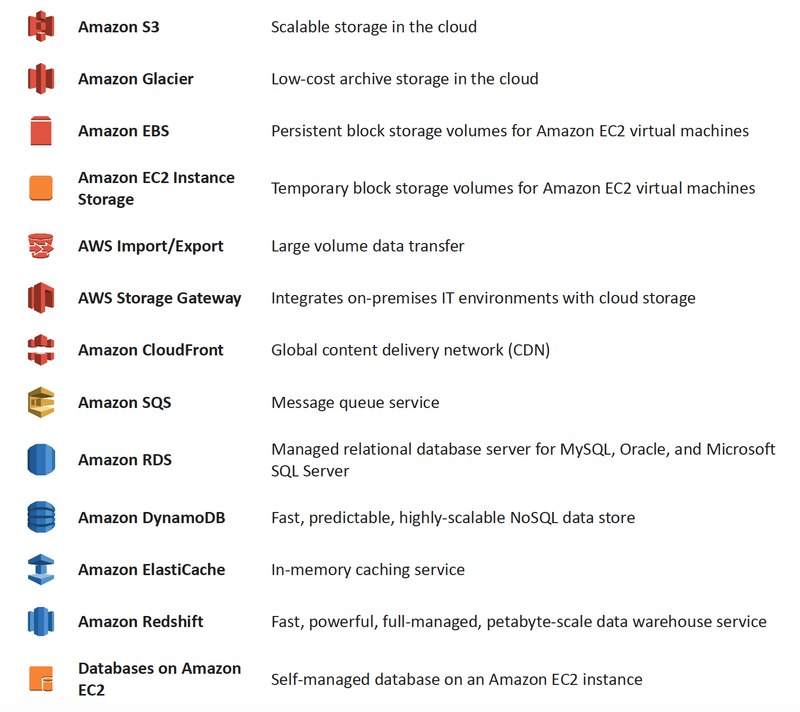 The company should deploy an amazon relational data base service relational database with a store objects table that has a row for each stored object along with size of each object. The upload server will query the aggregate consumption of the user in questions by first determining the files store by the user, and then querying the stored objects table for respective file sizes) and send an email via amazon simple email service if the thresholds are breached. The company should write both the content length and the username of the files owner as S3 metadata for the object. They should then create a file watcher to iterate over each object and aggregate the size for each user and send a notification via amazon simple queue service to an emailing service if the storage threshold is exceeded. Launch a multi-AZ MySQL Amazon Relational Database Service (RDS) Read Replica connected to your multi AZ master database and generate reports by querying the Read Replica. Perform a daily table cleanup. Implement a multi-AZ MySQL RDS deployment and have the application generate reports from Amazon ElastiCache for in-memory performance results. Utilize the default expire parameter for items in the cache. Query a multi-AZ MySQL RDS instance and store the results in a DynamoDB table. Generate reports from the DynamoDB table. Remove stale tables daily. Also, the data is backed up in off site tapes where Glacier can easily replace the functionality. In D they said Multicast. Multicast is not directly supported in public cloud. In the BrainCert Exam – They are conceding option D. Because as the updates are made on the single file (temp). S3 is not a storage and not a efficient solution to do updates to a single file. can you confirm? EBS with Provisioned IOPS (PIOPS) to store I/O files SQS to distribute elaboration commands to a group of hosts working in parallel Auto Scaling to dynamically size the group to hosts depending on the length of the SQS queue. Did you clear the exams ? Option D. is technically right but it’s not a “cost minimum” option since “a set of servers get the vote from SQS and write to DynamoDB” is a waste. #B is not scalable as it can’t handle the rapid influx of traffic and is making a direct call to dynamodb. I would always go with #D with the queuing mechanism and scaling as per the queue size which will help me control the cost. Option D. Lack of info about instance type and autoscaling configuration for app layer after the SQS. S3 and DynamoDB designed to be able to auto scale based on user usage. Java script clientside will populate data directly to/from DynamoDB after loaded on client. how this answer gives high availability and scalability? For Question 5: b, c, e is not the answer? as it is already running on extra large DB? A is about scaling out as the threshold is too low it is wasteful. E would require the complete replication of site in other region but latency based routing would not guarantee performance worldwide from all regions. Question 9: I think Answer is A and not B. B states to backup RDS to glacier directly. I don’t think that is possible. Please clarify. Thanks Raj, corrected the answer. Q5 c. “Mobile application will send device location using SQS” – does not sound right. A – webservices endpoint would be better? Key point here is push notifications. AWS Mobile Push is supported through SNS to push the offers. Also, its an Mobile application which can send the location to either SQS or web service endpoint. SQS is just scalable and async to support 5M customers. Jay – I don’t know how a mobile app will send/interact with SQS – likely thru a webservice endpoint- that is my point. SQS likely can stand behind the webservice end point. Jay – OK, yes that would work. Also C (unlike A) uses mobile push notifications – so is the better answer anyway. Hello, I think the answer to Q11. should be a,b & c.
Multi AZ is not a scaling option, but only an High Availability option. For Question 16, isn’t READ REPLICA required along with Cloud Front, since it has to serve millions of fans. You can generate the reports once and store in S3. Once generate, only the report needs to be served, which can be done using CloudFront with caching and origin as S3. it will be cheaper to store data on S3. Couple of things do not work in Option D’s favour. 1. Access control, the Mobile Application needs to utilize STS, Web Identity Federation to access even DynamoDB. Which it mentions directly. 3. For the Cost, if you end up storing objects in S3 and data in DynamoDB. Remember you reduce DynamoDB cost, but pay for S3 storage, PUTs and GETs as well. So you are almost paying twice for same request. Also, with S3, it would not make sense if the data is changing and not just read only. Why isn’t this an answer ? – Set up a second installation in another region, and use the Amazon Route 53 latency-based routing feature to select the right region. For E, even if you setup two regions the traffic for this two regions would improve and it would improve slightly for worldwide audience depending upon the region, which is not specified in the question. This solution also increases cost as you would need to have a identical setup. CloudFront can help in handling static and dynamic caching of resources, which would improve the times as well as the load on RDS is heaving so caching can improve the performance. Can you brief on why D is a suitable answer for question 6. Its more of scale out or scale up. Other 2 options do not really have any benefit and would be costly. For Q4, why is below answer not correct? The cost. If you have direct insertion into DynamoDB, the provisioned throughput required will be very high and hence the cost. SQS can help reduce the cost while providing loose coupling. But in the Option D it is launching additional EC2 instances to do the ingestion job. Isn’t that adding to the cost? that is scaled as per the load, so the costs are still minimal, which cannot be done with DynamoDB you pay for the provisioned throughput all the way and it can be quiet expensive. I think the answer to the question 15 is not a) but rather c). SWF will do this but there is no explanation of how total space taken by user will be recorded and aggregated. Your answer just simple states that email will be dispatched. C) explains how the total file space will be kept up to date. Iterating over S3 is not a good option, as it does not return all the records and needs to be paginated. You need to inline increment the counter and define thresholds to trigger emails. But a) explains none of that. S3 does return all the records with pagination. I politely disagree. In the last of some questions, you wrote professional, I just want to know that, these questions only for professional level or also for executive level? they are mainly professional level, with longer prose and long answer options. They are good for preparation, however if they seem too tough you can ignore. You can send location using Mobile push, but use it to push to Mobile. Hence D is not an valid option. Hi Jayendra, why do you think it’s not A? With A this is a cost involved with ELB and scaling and makes it a request/response model. SQS helps buffer the requests. Also AWS mobile push would be a better cost effective options then the third party provides. If available, always prefer an AWS service over the external services. Q8) EBS would be preferred over S3 as the updated are made to single temp file. S3 is not a storage and not a efficient solution to do updates to a single file. So Option should be D ? The question is actually poorly framed or copied. S3 would not be suitable choice, However, the point is with EBS volumes the single file cannot be shared. It would be different file. Hi – Quick thing, the reference to whitepaper link is broken. Could you please fix it. Thanks, changed the linked to active reference now.